Thanos returns to his glory only to reach the end of time to witness his greatest glory and ultimate shame! On Chitauri Prime, The Mad Titan has set foot in their gladiatorial arena a few hours ago and he almost forgot about the tyrannical Chitauri before that. He conquered their homeworld after decimating anyone who came in his way and crushed the skull of their king under his boot but was very disappointed upon finding no challenge here. As he sits on the throne while his new army cheers for him, one of them pledges their entire armada for him and asks if he would ask his "God" to stop killing them now, causing him to wonder! Since the creature appears like Phoneix and cuts through their defenses sooner than he did, they thought it to be his God. At that very moment, blood starts raining heavily from sky as Leviathans were getting slaughtered and Thanos started to smile after a long time, because it strongly stinks of Death. Soon the mysterious being is revealed to be a cosmic version of Ghost Rider! Although he is all hellfire and brimstone, but neither Johnny Blaze nor Danny Ketch has become Spirit of Vengeance this time and he is from future. 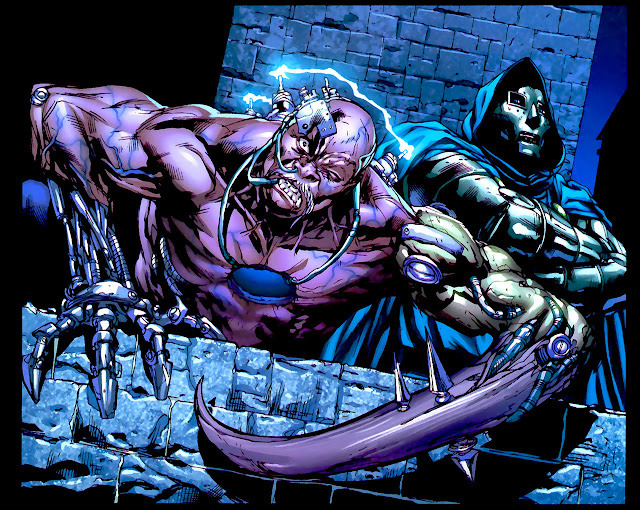 The Rider asks Thanos to come along but he refuses to oblige and tells Mephisto to come and meet if he wants to. He is confused and explains that killing son of Titan will mess up timeline only to get punched on face. Before making another move, he is wrapped in chains by GR, which are made off the bones of Cyttorak. The pawn of Hell also possess a fragment of Time Stone and teleports them both using it. 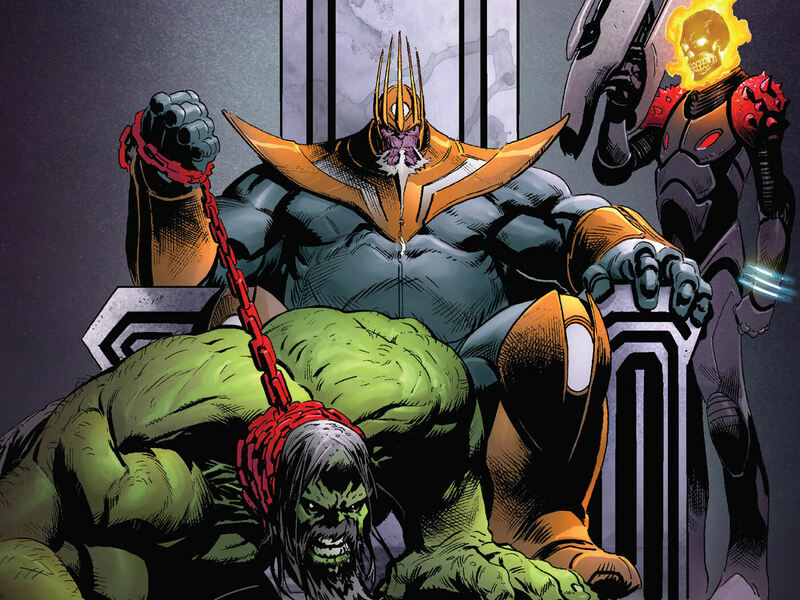 Million years into future, he delivered an imprisoned Thanos to his master, Final King, who is an older version of The Mad Titan. There are mightiest beings in existence that are superior to everyone else and there are heroes who protect the entire universe from major threats. However, deep down inside them all are afraid of one single thing, to see Thanos win! Unfortunately, it finally happened and sitting on the skull of Galactus, he tells to his younger self how the entire universe was doomed the moment he was born. One by one, he took down every heroes of Earth with precise planning when they slowly grew old and when a group of Celestials came to judge, he vanquished them all with a thunderous scream of Inhuman King, Black Bolt. Angry over dragging him through time and still in disbelief, Thanos knocks his older self but decides to align with him moments later, when he finally proves him to be the real deal. He brought his younger counterpart to this timeline for his help in killing The Fallen One, a former herald of Galactus and after killing every living thing in the known universe, he is the only one left to deliver to Death. Despite once being a terror for everyone, the Final King seeking his help to kill a rogue herald doesn't seem plausible to Thanos. Here is your links to buy "Thanos – Thanos Wins" from Marvel Comics in issues on Amazon. 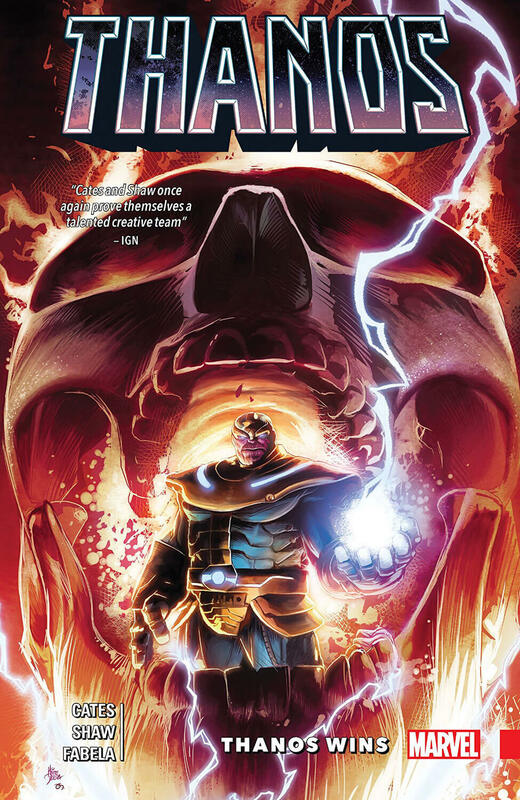 Here is your link to buy "Thanos – Thanos Wins" from Marvel Comics on Amazon. 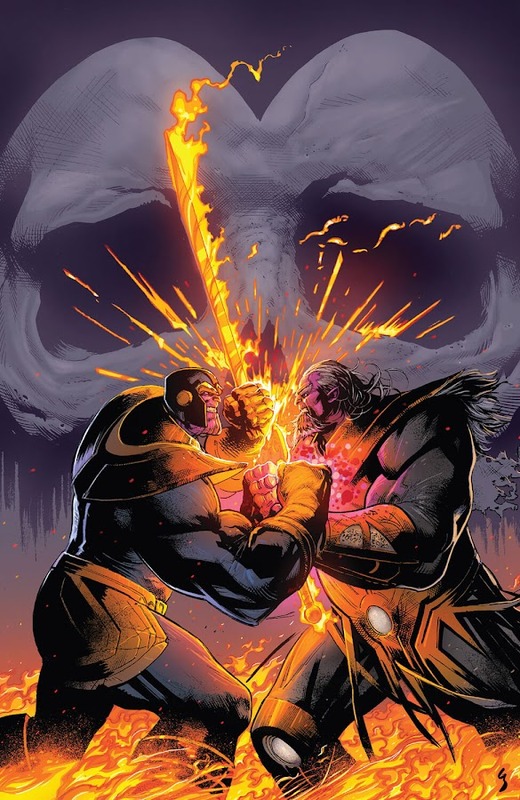 The second monthly ongoing volume of Thanos have already shaken things up by revealing him dying in "Thanos Returns" and then restored to his old form in "The God Quarry" storyline. Now, Marvel Comics brings writer Donny Cates (Doctor Strange – Damnation, Doctor Strange – God of Magic) and Geoff Shaw (Buzzkill, God Country) to cook up the third plotline featuring another mad conquest of the Titan in 2018, which collects issues #13-18 and Annual issue #01. Al Ewing, Christopher Hastings, Katie Cook, Kieron Gillen (Angela – Asgard's Assassin, Beta Ray Bill – Godhunter) and Ryan North joined as guest-storyteller, while Frazer Irving and Katie Cook joined to provide illustration aid. Following the past two stories, Thanos faced his son Thane and then allied with his brother Starfox and estranged daughter Nebula to defeat him before finally restoring his godhood. This very arc briefly explores how he continuously threatened reality over time during the events of Infinity Gauntlet, Infinity War, Infinity Crusade, Annihilation Wars and Infinity. While invading Earth for the final time, he was opposed by Captain America, Doctor Strange, Hulk, Iron Man, Luke Cage, Mister Fantastic, Spider-Man, Spider-Woman, The Sentry, Vision and X-23, all of which fell before him. Cates brilliantly took a spin on the origin of Cosmic Ghost Rider and how he turned into Black Right Hand of the Final King. Following her resurrection after "Ragnarok Cycle", Asgardian Goddess of winter storms, Kelda went to Midgard and eventually fell in love with a mortal man named Bill. Having informed of her mortal lover’s unexpected death, Kelda is out for vengeance and seeks Doctor Doom and Loki, as they are the one who were instrumental in Bill’s death. In Latveria, inside Doom’s castle, she blasts Doom with a lightning bolt only find out that it was a mere Doombot that took the blast. So, she entered the lab inside the castle to seek out the real Doom, only to be captured by another Doombot who tore her heart out when Doctor Doom showed up and expresses his curiosity about the physiology of Asgardians. The Asgardians are a race of near immortal creatures and for years, they were known for their legendary superior lifespan and durability among all of nine realms. 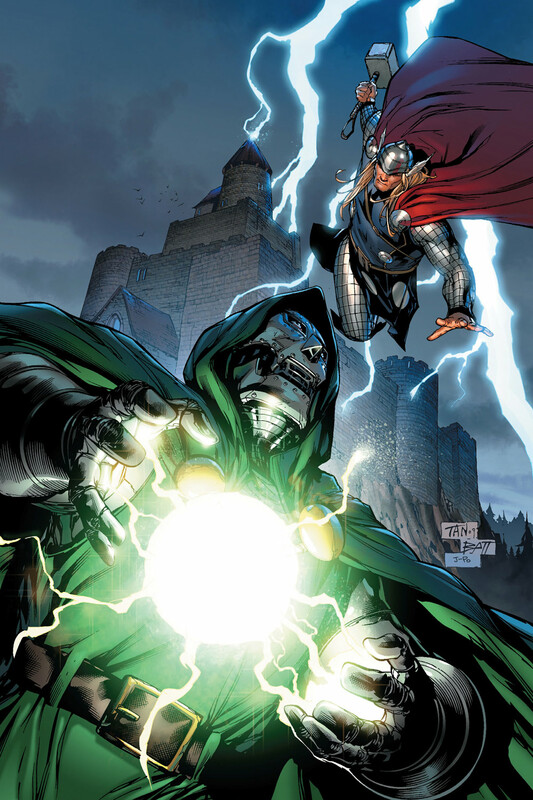 The Latverian tyrant Doctor Doom was always keen to discover the genetic secret of Asgardians and to succeed in his latest schemes, he is capturing many Asgardians and is conducting experiments on them. In Broxton, Oklahoma, Asgardians have gathered, declaring war against Victor Von Doom and with assembling every one of them out there in one place, demands their missing relatives back. The Mighty Thor is back from his exile and realizing how bad the situation here really is, joins the fight immediately. But Doom has a powerful secret weapon yet to reveal, that is more than an army of Doombots at his disposal, to tackle the wrath of the Asgardian forces. 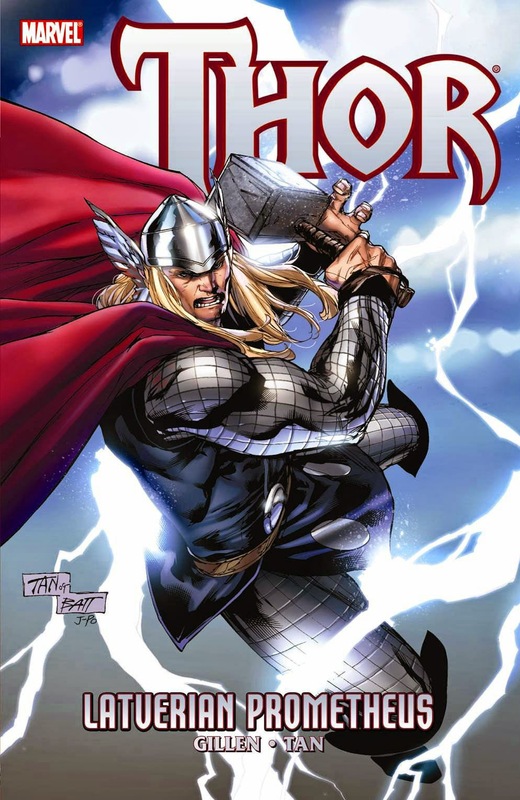 Here is your links to buy “Thor – Latverian Prometheus" from Marvel Comics in issues on Amazon. Here is your links to buy “Thor – Latverian Prometheus" from Marvel Comics on Amazon. "Latverian Prometheus" is a three part storyline that took place in the first monthly ongoing Thor comic-book series featuring The Mighty Thor and it ran from issue #604-606. 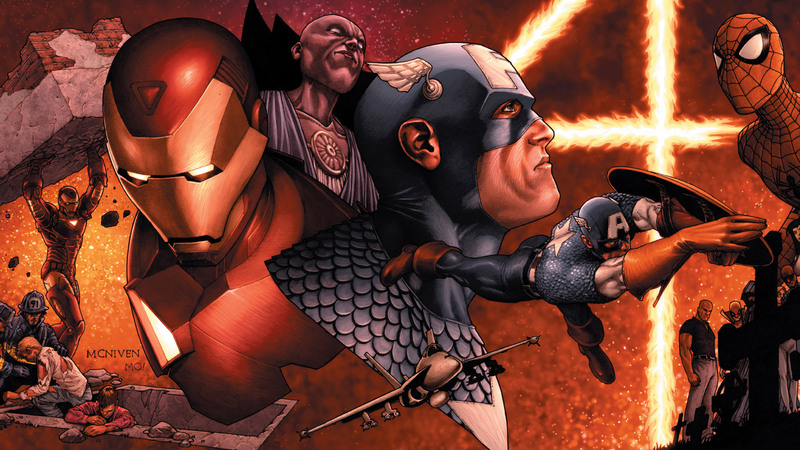 The story was published in 2010 from Marvel Comics as writer Kieron Gillen (Angela – Asgard's Assassin, Beta Ray Bill – Godhunter) and artist Billy Tan (Darkness/Tomb Raider, Elektra/Cyblade) were given the task to complete the story. Even though the plotline does not feature a major reckoning threat, The Destroyer made an appearance to play an important part.. 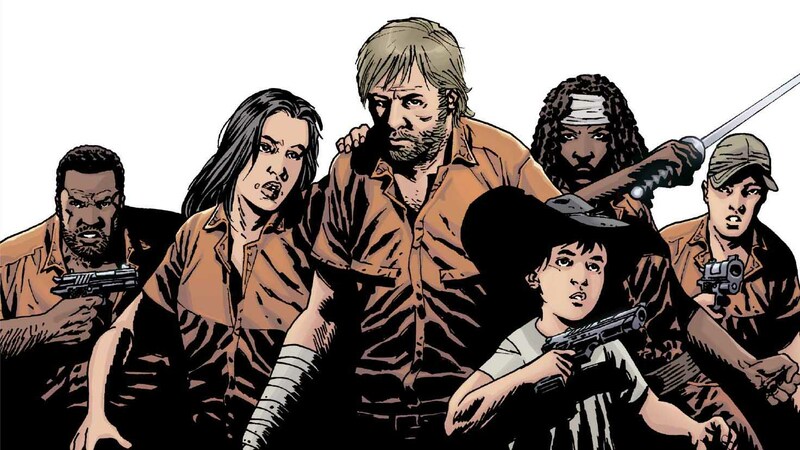 This storyline is next followed by “Thor – Siege”, which is a tie-in story to 2010's Marvel crossover event “Siege”. A young human orphan from Corellia, who grew up to be galaxies' most notorious smuggler, Han Solo used to work for Jabba the Hutt after finishing the Kessel Run within twelve parsecs. He mostly hangs out with his Wookiee best-bud Chewbacca, who is also his first mate aboard the Millennium Falcon ship and has a friendly rivalry going on with fellow smuggler Lando Calrissian. His life was completely changed when he agreed to take young Luke Skywalker, veteran Jedi Master Obi-Wan Kenobi and their droids R2-D2 and C-3PO to Alderaan system for a pretty hefty payment. Solo lost his parents in a very early age and rose by pirate Garris Shrike along with his crew before he finally escaped as a teen. From then, Han started out as an outlaw smuggler, working for his own interests. He had a short history with Bria Tharen of the Rebel Alliance until she left him for the sake of her duties. When he saved a Wookiee named Chewbacca from the internment of an Imperial officer, it became his closest ally and swore a life debt to the outlaw. The Millennium Falcon actually belonged to Lando, which Han won in a gamble and used for his future endeavors. Solo and Chewbacca were at Cantina looking for some ways to pay off his debts to Jabba or he is in trouble. When former Jedi Master Obi-Wan Kenobi approached him for a safe passage to the Alderaan system with Luke Skywalker and the droids, Han charged them more than his usual. Surprisingly, Obi-Wan raised his bid before leaving the place, offering more than what was asked for and that made Han quickly accept the job. Seeing a way to finally pay Jabba the Hutt, he sends Chewbacca to get the ship ready. Before leaving the Cantina, Solo came across bounty hunter Greedo and shot him first. He soon is confronted by Jabba with his bounty hunter Boba Fett and barely managed to convince them to let him go so he can repay the Hutt. As they were about to leave, Stormtroopers shot at them but Solo ditched them and two Imperial Star Destroyers as they jumped into hyperspace. Although, a non-believer of the Force, Han witnessed its power when he saw Obi-Wan training Luke but still remained skeptical. The band reached to Alderaan systems when it was already destroyed and discovered the Imperial space station, Death Star, which pulled them in. Darth Vader ordered the Stormtroopers to search the ship and Han Solo took them down to go looking for Princess Leia in their guise with Luke. After rescuing Princess Leia Organa, he eventually got involved with the Rebellion to oppose The Empire. Obi-Wan sacrifice himself in a lightsaber duel with Vader so that they could escape in Millennium Falcon to Yavin IV. Although Han wanted to leave right away after collecting his payment, he eventually fought alongside the rebels in the Battle of Yavin before Luke destroyed the Death Star for the Rebellion. Three years after blowing up the Death Star, the Rebellion has moved to ice planet of Hoth and Han Solo goes looking for a missing Luke. He finds Luke unconscious and managed to rescue him after keeping his friend from freezing to death. Upon convinced by bounty hunter Ord Mantell, Han finally decides to pay his debt to Jabba the Hutt but Princess Leia thought he was leaving and requests him to stay with the rebels. Han thought Leia romantic feelings, which resulted in a heated conversation. Han Solo and Chewbacca found and destroyed one of the probe droids employed by Vader but by then, it has managed to inform Imperial fleet about the rebels. Darth Vader heads toward Hoth with reinforcements and the rebels attempt to retreat beyond outer rim. When the Sith Lord arrived on Hoth, Leia is rescued by Han and escaped in Millennium Falcon alongside C-3PO and Chewbacca. Aboard the ship, Han and Leia shared a passionate kiss before ditching the Imperial fleet into an asteroid field. Unable to make a hyperspace jump, Han Solo land on an asteroid to repair the ship but the threat of space slug Exogorth forced them to flee to Cloud City. There, Han and his group are welcomed by his old friend Lando Calrissian, who runs the place. Meanwhile, Vader summons a few bounty hunters to bring the Millennium Falcon to him and Boba Fett eventually tracks them to Cloud City. Lando lured Han, Leia and Chewbacca to a room where Darth Vader was already waiting for them. Since he planned to put Luke into suspended animation, Vader froze Han in carbonite and handed him over to Boba Fett. Frozen in carbonite, Han Solo is taken to Jabba's Palace by bounty hunter Boba Fett and Jabba the Hutt kept him as his most favorite trophy. Following his previous battle with Darth Vader, Luke Skywalker and his friends came to rescue Han from captivity. Whatever ruse he tried with Jabba didn't quite catch on and upon discovering that they all are here to free Han, he condemned them to Sarlacc pit. Han was still experiencing temporary blindness because of the hibernation and in the ensuing chaos; he shot Fett's jetpack, sending him into Sarlacc. Back at his feet, Han joined forces with the rebellion once again and by this time, The Empire has already built the second Death Star. Han became General Solo during the Battle of Endor and led the rebels to blow up the shield generator of Imperial super-weapon. On the forest moon of Endor, their group had a run-in with Ewoks tribe, who eventually helped the rebels in their mission. Seeing the strong resolve of his son for him, Vader manages to kill Darth Sidious to save Luke and following the destruction of the second Death Star, Han and Leia finally reunites. Galactic Empire has fallen thirty years ago and now The First Order is menacing the galaxy, while General Leia Organa oppose them with the Resistance at her side. An elderly Han Solo and Chewbacca pulled the Millennium Falcon with a tractor beam after finding it on Jakku, only to discover scavenger Rey, former First Order Stormtrooper Finn and droid unit BB-8 inside his ship. These three were running from Imperial Troops looking for the droid, who now has the map leading to the location of self-exiled Jedi Master Luke Skywalker, whom both the The First Order and Leia is looking for. 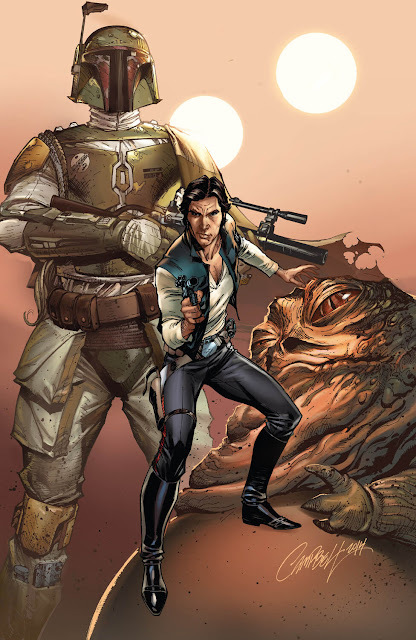 Han and Leia had a son named Ben Solo, a Force-sensitive child who was sent to the newly built Jedi Temple of Luke Skywalker to train with him. However, the boy was seduced by Supreme Leader Snoke of the First Order to the dark side and he ultimately became a Sith Lord named Kylo Ren. Han then went back to smuggling and returns years later to help the Resistance take down the First Order after coming to meet Leia. With Chewbacca, Finn and Rey, Solo goes to his final mission at Starkiller Base, where he confronts his son to reach out to him only to be stabbed by a lightsaber and fall to his death. 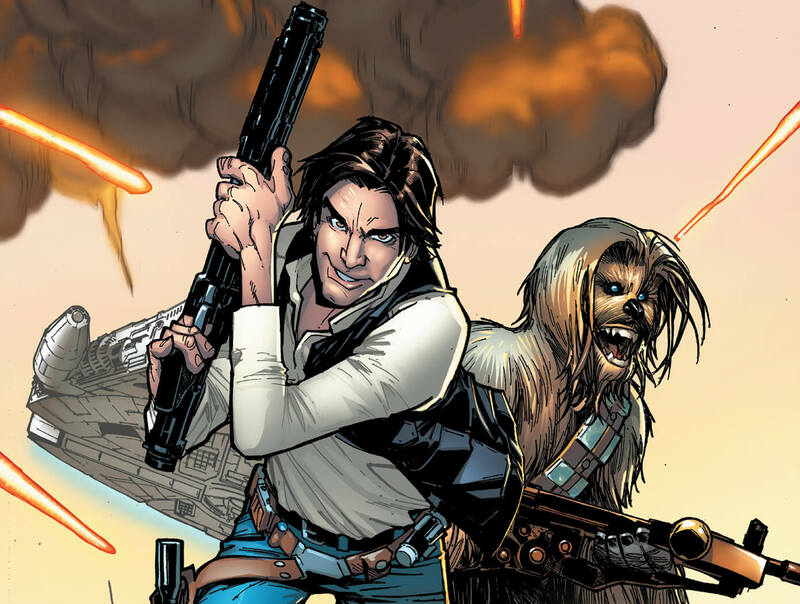 For more information on Han Solo comics series, you can check out these links below. 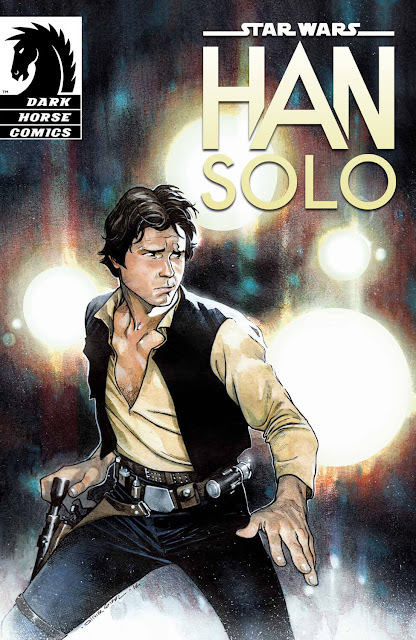 Here is your links to buy "Han Solo" comics from Dark Horse Comics and Marvel Comics on Amazon. A fictional non-jedi human from Star Wars universe and a prominent figure of original trilogy, Han Solo was created by filmmaker George Lucas and portrayed by actor Harrison Ford, when he first appeared on Star Wars Episode IV: A New Hope in 1977. Even though he was created as a loner, he was associated with popular characters like Chewbacca, Lando Calrissian, Luke Skywalker and Princess Leia. Han was also unknowingly responsible for the predicament of notorious bounty hunter Boba Fett during their final confrontation at Sarlacc's pit, while making an escape from his captor Jabba the Hutt. On publications, both Dark Horse Comics and Marvel Comics have published many issue featuring Han Solo contributed by popular comic-book creators Greg Rucka (Cyclops, Elektra), Jason Aaron (Thanos Rising, Incredible Hulk), Kieron Gillen (Iron Man, Young Avengers), Leinil Francis Yu (New Avengers, Secret Invasion), Mike Deodato Jr. (Original Sin, Secret Avengers), Salvador Larroca (Fantastic Four, Ghost Rider) and Stuart Immonen (Fear Itself, Inferno). Han Solo is also the father of young Ben Solo who grew up to be a ruthless Sith Lord named Kylo Ren. In live-action films, Solo's last appearance was in 2015's Star Wars Episode VII: The Force Awakens, which also marks the debut of Kylo Ren's character. As he was known as the best bounty hunter in the entire galaxy, Jango Fett was approached by Sith Lord Darth Tyranus to be a genetic template of a Clone Army for The Republic. Not only has he received a very handsome payment for that, he also collected an unaltered clone whom he named Boba Fett and started raising him as his own son. Jango was decapitated by Jedi Master Mace Windu when confronted in the first battle of Clone Wars. This motivated a young and grieving Boba to follow his father’s path of becoming a bounty hunter and take revenge on the Jedi Master who killed him. Even though his attempt at retribution on The Jedi for Jango's death failed, he quickly formed his own gang and gained status as one of the galaxy's deadliest bounty hunters. 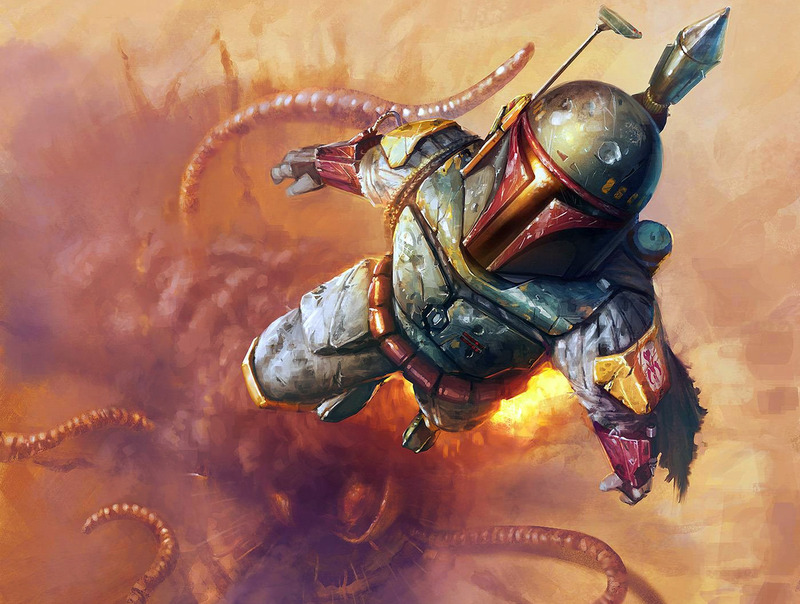 Boba had established a syndicate of bounty hunters by himself and worked for Jabba the Hutt. When Sith Lord Darth Vader came to Jabba's Palace looking for best bounty hunters, Jabba sent Boba Fett to Vader. Boba had to apprehend the young Luke Skywalker and the vessel Millennium Falcon for Vader. Fett left a trail of dead bodies hunting for Skywalker, whom he finally found and tried to take him as a prisoner with no success. Even after his failed attempt to get the boy, Boba was hired by Darth Vader again years later to bring Hutt's best smuggler Han Solo. Boba later delivered a frozen Han Solo from Vader to Jabba's but Solo's rebel friends managed to rescue him in time and a briefly blinded Solo accidentally banged the bounty hunter into the sarlacc pit. 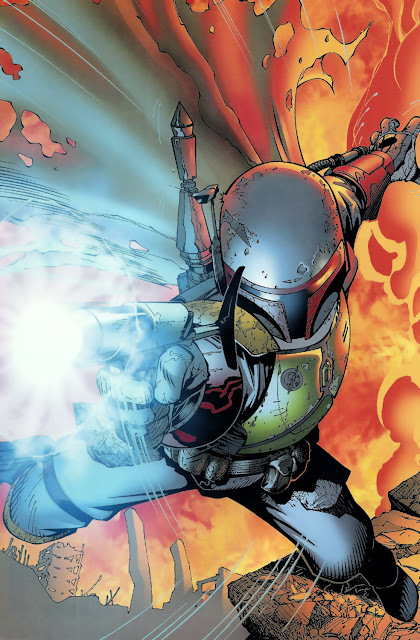 For more information on Boba Fett comics series, you can check out these links below. Here is your links to buy "Boba Fett" comics from Dark Horse Comics on Amazon. A character that was originally introduced in Star Wars: Episode V: The Empire Strikes Back in 1980 and given an origin story later in Star Wars: Episode II: Attack of the Clones, Boba Fett is a fictional bounty hunter who belongs to the Star Wars universe. 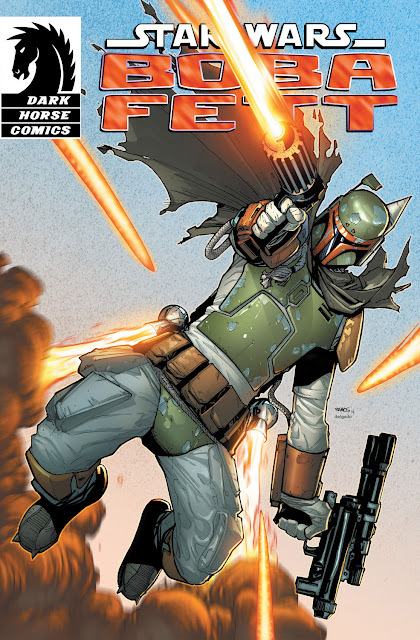 Fett was created by George Lucas and he later became quite an important role in the Star Wars ongoing series and story arcs released by Dark Horse Comics. Writer John Wagner (Aliens – Berserker, Judge Dredd) played a very prominent role in exploring the character throughout his various major and minor comic-book appearances in the early days. Even though the allegiance of the character is neither good nor evil, he still is arguably one of the most celebrated personalities of the franchise and that even earned him a place in the games based on the chronology as well as the TV series titled “Clone Wars”.